Cold porcelain is a corn-starch (corn-flour) based modeling material which remains strong and slightly flexible after air-drying. As its name suggests it does not need firing and yet resists damage from moisture if sealed. It is finer and looks more like porcelain than flour based clays. Corn-starch/flour amalgamates with glue and oils to form a modeling clay. This clay can then be worked into intricate sculptures. The work is then left to dry (like glue) to form a strong and resistant synthetic porcelain-like substance. Rather than painted afterwards, most artists blend in colours before modeling, using tiny drops of poster paints (tempera) or even dabbing with felt tip pens. If you don't colour the cp clay, it will remain in its raw state which is too transluscent. So that's why our resident expert Sangeeta includes a bit of white tempera poster paint into her basic recipe. Treated in this way, it looks more like porcelain when it dries. Remember, porcelain is beautifully transluscent, but only when held up to the light. There are proprietary brands of cold porcelain type modelling clay that you can buy, but this page is about making your own. It is not an easy task to make CP yourself, but this section is here to help. The key to it seems to be sourcing the right ingredients, as regional variations in, say, the glue can alter the consistency. Right consistency is key. The mixture can easily become too sticky if too moist. The answer is to add small amounts of additional corn-flour. Conversely, the mix can become too dry and cracky if the glue is too thick, or there is too much corn-starch (flour). We have a leading expert Sangeeta Shah sharing her tried and tested recipe and answering questions. 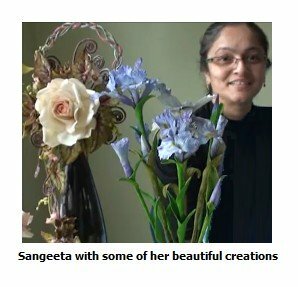 Many different home-made recipes for cold porcelain are readily available online, but Sangeeta's has been described by our visitors as the best recipe they have ever tried. 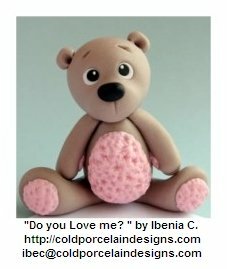 This is the place to learn all you need to know about making and working with cold porcelain, so if you agree, why not bookmark, like and share? On the bottom half of this page are our visitor's comments, feedback and findings. Much can be learned from the contributions here. They are for everyone who has tried cold porcelains and air drying clays of all types, whether beginner or expert. So What Can You Do With Cold Porcelain? Once you have practiced with and perfected the recipe, what can you make with this lovely modelling clay? As you can see from the the lovely flowers of Sangeetas shown above and the fun little cute teddy on the left (sculpted and uploaded by Ibenia), there is a range of different sculpting projects you can embark on. I rather like this teddy's expression and fluffy pink tummy and paws. The one area I am not sure of is how well you can sculpt faces with this medium. I have never tried, but would love any input from people who have had some success. 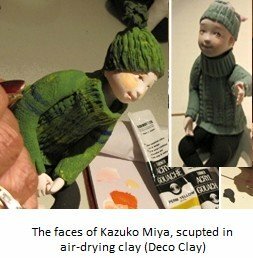 I did dome research and found the work of a Japanese lady who promotes her own range of air-drying modeling clay called Deco Clay. Kazuko Miyai is a Japanese artist based in Hawai. Both her and her daughter Yukiko Miyai are artists, specialising in intricate and realistic looking flowers. I noticed that Kazuko, in particular is also fantastic at lovely, but very simple faces. I think these faces are really good. How cool is the green bobble hat and jumper too. This is really nice art. People have written in to ask whether or not it is possible to sculpt figuratively in cold porcelain, observing that realistic flowers are the norm. I think Kazuko answers that. If I were to look at cold porcelain, I would take much inspiration from Kazuko's interpretations. I am not sure what their recipe is exactly. I suspect it is based on a corn-flour/glue/oil recipe, but I can't be sure. It qualifies in this section because it is described as modeling clay that hardens without baking and is smooth, lightweight and can be rolled petal thin, retaining its shape when dry. Their clay (which they market along with tools and instruction booklets) is called "Deco Clay". I have started a discussion thread about it and need you to tell me what you know please. If you can get hold of some, try it and report back. I am trying to find out more about the clay and what you can make with it etc etc. As far as I can see, cp is an excellent medium. You can make it yourself quite cheaply, and it has amazing qualities. If I were starting out, I think this would be one of the modelling clays I would definitely look at. Also it seems to allow you to let your imagination go. Don't be hemmed in by any pre-conceived ideas. Dolls, figurative or fun sculpts. Anything goes. Just use your imagination and create your vision in 3D. 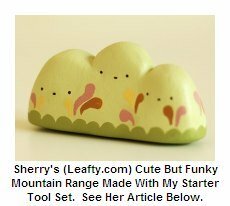 For example, I simply love the "mountain range" Sherry sent in. 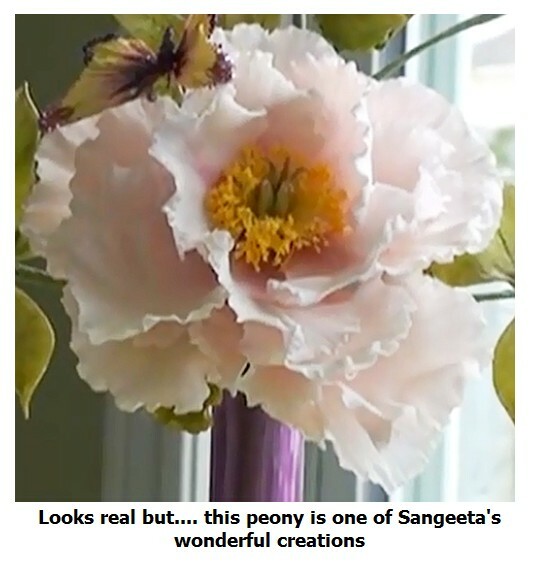 Many thanks to Sherry for uploading this picture and showing us just what is possble with a little bit of imagination. How funky is that cute little creation! Thanks to all those who have contributed to this page. I hope you enjoy reading, learning and participating. OR . . . What stories do you have about other air drying clays? Cold Porcelain or Paperclay? Any others you need to tell us about? TIP: Since most people scan Web pages, keep your sentences short. Do you have a pic of your work in progress or finished piece? Great! Click the button and find it on your computer. Then select it. Beautiful! My mom had a recipe for this since I was a young girl... I've adapted this and made so many beautiful things... Out of practically nothing! Cold Porcealin Recipe Tried For the First Time and I Love It! Cold Porcelain is my passion . Cold Porcelain Paste - How can we do it? DOES THIS COLD PORCELAIN DO FOR OUTSIDE?